Limited Hangout, or just Limited Crimes? A government cover-up of massacres in Myanmar was the arrest of two Reuters journalists and others on December 12 (DW), reportedly as they were looking into killings at Inn Din, on the southern coast of Maundaw township. An unusual government announcement of Dec. 18 noted unidentified “people being killed and buried” in a cemetery there (Reuters). A December 19 NYT report says the journalists had obtained photos from here. "Five ethnic Rakine locals" and not Rohingya, "were arrested for supplying the photos." What seems to be a photo of one of the photos with labels added (but unreadable) was shown Dec. 20 on Twitter by a pro-Rohingya activist (see right). At the risk of setting a precedent, the government now admits its forces engaged in unlawful killings in Inn Din. It was not on orders, the January 10 announcement from the army chief's office says, but hot-headed soldiers and Buddhist locals on their own initiative. Upset over attacks and a recent murder of one of their own, they decided to execute 10 ARSA fighters ("Bengali terrorists") on September 2, after capturing them during a foiled attack on August 31. "Some villagers from Inn Din village and security forces confessed they killed 10 Bengali terrorists," a translation of the Facebook post said, according to Radio Free Asia. "The decision was made to kill them at a cemetery. The army will take charge of those who are responsible for the killings and who broke the rules of engagement," the statement continued. "This incident happened because ethnic Buddhist villagers were threatened and provoked by the terrorists. This has been heralded as a first crack in the façade of denial, an unprecedented admission some say should lead to the government starting acknowledging the rest of their alleged crimes. But of course "should" doesn't mean "will," and people are expecting this is just limited hangout before Naypyidyaw call the massacres case closed. But it's also a crack in the impression of a cover-up. Why admit to anything if you're guilty and intent on keeping the lid on it all? The government vows to punish the criminals who broke the rules of engagement with those killings, and likely will. They also might now free the journalists jailed, it seems for trying to report on what they now admit (or maybe on a different version of it?). But don't wait up for any more substantial admissions. There may be another incident or even two of this sort they'll acknowledge, but so far only this one has found bodies, photos, Rakhines apparently trying to admit to it, and a story we now hear that has a certain plausibility. Other alleged massacres are of a vastly different character, with scores or hundreds of civilians killed, with utmost cruelty and for no reasons. So far they're also lacking in credible evidence. These - Tula Toli, Maung Nu, etc. - Naypyidaw will probably continue to deny. And perhaps they would be right to do so. Strangely, even as the government side admits to the killings, the opposition's story appears to be poorly-managed fiction like their others. Maybe it's just reflexive, or maybe they're just trying to hide the fact that these were militants, but alleged witnesses keep changing the story for some reason. If you think the government is holding out on the truth, the following should convince you no one is telling it like it was. 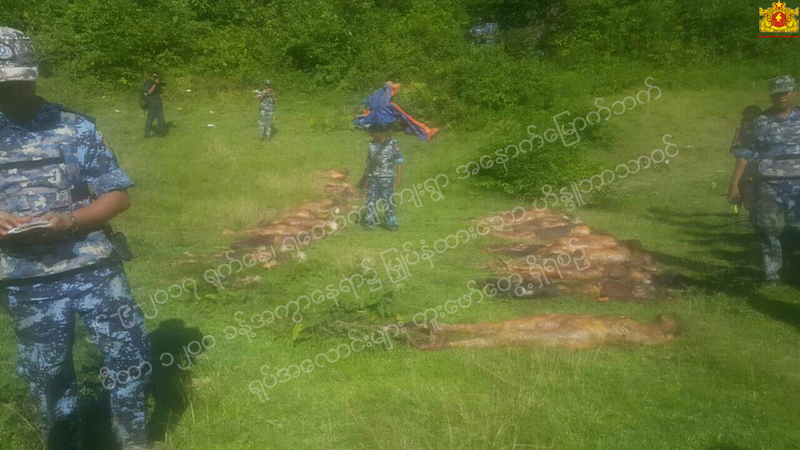 An AFP report (via Frontier Myanmar) quickly followed the government's admission of ARSA fighters killed, passing on claims the victims were civilians - "fishermen, farmers, lumberjacks and clerics". As I commented on a Frontier Myanmar tweet about this: "To do: check what (activists) say now, what they said before, compare to what gov. says, consider logic and read between the lines, etc. Most will not do these things." I wasn't sure if even I would find the time, but here we are, and it's worth yet another post. In the above photo (if it's authentic - likely), the men are not dressed in the black outfits associated with ARSA. That could have a few causes. Maybe the black clothing isn't mandatory, especially for recently-pressed conscripts. Maybe they had time to remove these while ditching their weapons to play civilian. And maybe they're outright civilian. An Amnesty International (AI) report from last October was an earlier source, drawing on 7 alleged witnesses. As they heard, the killings were on an unclear date "several days" after the 25th - could be August 28 or 30 or September 2. How many wasn't clear - their witnesses "identified five family members who had been killed," and recognized an unclear number of others. Something like 10 total is likely, but the number isn't set. "In general, the Myanmar military appeared to target Rohingya men in particular," but maybe not exclusively. One man says he left his handicapped mother behind in their house, only to have it burned down with her inside (possible accident). But none of the men killed was a fighter. Now we see the photo of all 10 rounded up and bound before execution. But in this early version, the victims seemed to die from random shooting. "As people ran away, the soldiers and BGP opened fire. Jamil, a 52-year-old farmer and small trader, said his cousin Zafor Hossain was hit by a bullet in his side as the two men attempted to run to a nearby hill." (Rohingya Blogger doesn't list anyone under the name Zafor or Hossain (maybe he had an alias or nickname they used?). Another conflict: AI heard how Jamil escaped to a hill, then came back later. Finding the body in the same spot, he "buried his cousin in a graveyard on the edge of the village, before going back to the hill." The report mentions that "several" other witnesses, of seven total, described "burying their loved ones" - perhaps in that same cemetery - after finding them where they fell. Most stories don't feature this, and most don't wind up with an identified burial, in a cemetery no less. This feels tailored to the facts but now, as we hear it, the men were buried together by their killers, not individually by their family. Inn Din villager Wal Marjan, 30, said they were attacked by Rakhine mobs flanked by soldiers, who later "selected 10 to 15 men to attend a meeting". They were never seen again, said Marjan, who was later told by another man that her husband and the others were slaughtered. 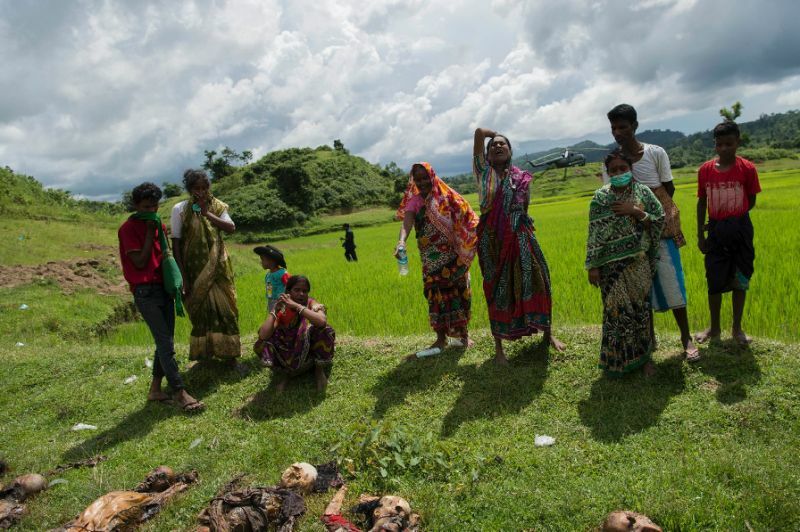 "He said his body was thrown into a mass grave with the other men," Marjan told AFP at a refugee camp in southeast Bangladesh, adding her husband had no connections with the Arakan Rohingya Salvation Army. So both the 'random shooting' and the 'arrested mushrooms' stories are out. Fighting age working men (and clerics) rather than elders or town leaders, were picked for this "meeting." That would be an unusual invitation list to talk things over, yet they naively went? Their bodies were then "thrown into a mass grave," implicitly by the killers, rather than into individual graves dug by family. This is an interesting story evolution. It doesn't quite prove, but strongly suggests, falsification that adapts to shifting perceptions of the story. It doesn't seem centrally planned, but improvised by different people with their own immediate concerns and little consideration for what's already been said. They probably figure one is keeping tabs anyway, and that would be about right. A best guess from what everyone says: these 10 ARSA fighters, likely all last-minute pressure recruits, were arrested on the 31st after engaging in provocative if not criminal violence. They were killed by their captors in an inexcusable act that could be somewhat understandable, given the full context. The Buddhists involved buried the dead and then confessed the crime, perhaps to reporters freely even before the authorities asked. 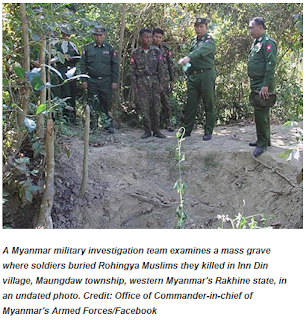 All the supposed witnesses from the Rohingya side have just been trying to tweak this story into another example of the regime targeting innocent Muslims, when they could have just let it go at the truth. Everyone knows they had some fighters out there, why not let a few be accepted as victims of an extrajudicial execution? Are they just allergic to the truth? So they insist the men were all civilians, and come up with a few clashing back-stories to support that. In the end their propaganda fails. Two smaller decried massacres of Rohingya, at Chein Kar Li and Koe Tan Kauk are near Inn Din, but I haven't studied them much yet. Amnesty International (same report linked above) explains both as featuring people who escaped up a hill after seeing someone either shot dead or left behind in a house that was burned, came down to verify the person was dead in that same place, and then fled. That's similar to Inn Din accounts, but no one mentions burial.
. I did not yet know whether my brother’s wife and children have not been accounted and have been killed. We heard most of them killed by terrorists. Our village Khamaungseik, where Hindus mostly lived, was surrounded by Bengali villages. Arshee Kumar, Maungtaw 4 ward. I lived with my family in Maungtaw. My daughter, my parents-in-law and my brother-in-law were among the victims. My daughter lived with my parents-in-law in Khamaungseik village (south). Dead bodies dug out included corpses of my mother-in-law and brother-in-law. The bodies of my daughter, only 8 years old, and my father-in-law have not been found yet. My spouse has suffered from a mental disorder since the brutal slaughter of the people. All were killed by throat slitting. Some were found to have been decapitated and limbs amputated. We want to find our daughter as soon as possible. I will not stop looking for my daughter even if she is found dead and it is only her skeleton. I pray for my daughter not to experience such a worse situation. Terrorists not only killed Hindus, including the cruel killing of children, but also raped the women. Among the corpses dug up were my husband and two sons. I could identify them as I well remembered their clothing. On the bodies were cuttings on their throats with limbs amputated. Some legs were almost completely cut. I survived because I had been in Maungtaw at an event. Fifteen of my relatives have not yet been found. Terrorists killed our Hindus in Khamaungseik. My husband’s two brothers were among the dead bodies dug up. Their names are Bisnia and Han Montie. Their wives and children were also killed. A mother and her two children and another mother and her three children have not been accounted for. We overheard that one was abducted to Bangladesh. I live now in Kyeinchaung village. My husband’s two brothers earned their living in Khamaungseik as blacksmiths. My sister, her spouse and her two sons were among the killed. Prior to the event, I fortunately missed being killed as I had been in Thamanthar village. Among the corpses dug out, there was the body of my sister. My sister wore her usual bangles on her wrist. By seeing these, I identified that it was her. The bodies of her husband and her sons have not yet been found. I live in Maungtaw. My two sons and my daughter lived in Khamaungseik. My elder son was married, as was my daughter. One son was still single. My sons were eking out a living as goldsmiths. Yesterday, my two sons were found among the dead bodies dug up yesterday. His daughter and child, including my daughter and her son, were abducted to Bangladesh. Over there, our Hindus found them and brought them, it was learnt. I had phone contacts with my daughter and daughter-in-law. It has been learnt that gold from their shop was robbed. 2:37 Anika says the killers came "wearing black clothes. only their eyes can be seen." This is the ARSA uniform. See them on video preparing for their jihad here, five days earlier. "we will give lives and take lives for Arakan." One interesting witness also describes killers in black, no insignia, faces unseen, who killed 108, including "Muslims too." In addition to Hindus killed, or in addition to themselves? He won't say if they're Muslim - he didn't recognize them. He says they were surrounded/threatened, imprisoned by them for five days before fleeing to (whatever camp this is) on August 31. This guy's putting it a bit differently gets Islamist propagandist Safiur Rahman to report it as probably government thugs, because they "killed Muslims too." Same guy (same interview, apparently, by Rahman it seems), read a bit differently by The Quint, given as 50-year-old Nalanjan. This also has an interview with Roksana Bala, who saw the men in black. She says they were blindfolded by the thugs, as well as held prisoner for days, not allowed to go out to bathe or anything. This is a story we haven't heard fully. She heard 86 other Hindus were killed in their town, but apparently didn't see it happen. She also fails to specify the killers were Muslims, just dressed like ARSA guys, but doesn't claim they killed Muslims either, so she wasn't promoted by Rahman, like Nalanjan was. Video claim of 108 bodies found is incorrect. Only 90 were ever expected, and only half of these found, last I heard. recounted their experiences on 25th August. 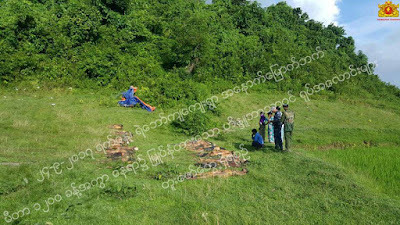 A group of about 500 Muslims terrorists led by a foreigner in black clothing and Noru Lauk from Khamaungseik Village entered their homes in Yebawkya village at about 8 am on 25th August and attacked. They took away their belongings, jewellery and mobile phones. Members of the terrorist mob repeated, “This is not your village. It is our territory. We are the sole owners of this land. You all are same with the Myanmar Armed Forces and police members. We will murder Buddhists and all of you who worship the statues made of bricks and stones. All Hindu villagers were then divided into two groups, according to gender. Their hands were tied and they were taken to Bawtala Village. http://hlaoo1980.blogspot.com/2017/09/massacre-of-maungdaw-hindus-by-arsa.html - great resource - several obscure and early reports compiled - some factual confusion (like attack said 9pm, but more like 9am, it seems). 22 “Hindus too fleeing persecution in Myanmar”, The Daily Star (Bangladesh), 31 August 2017; “Mystery surrounds deaths of Hindu villagers in Myanmar mass graves”, The Guardian, 12 October 2017; “Dozens of Hindus Killed in Maungdaw: Relatives”, The Irrawaddy, 5 September 2017; Kyaw Zaw Oo (Arakan National Party, Sittwe-2 constituency), Facebook post, 12 September 2017, http://bit.ly/2ApcmZ0; See “45 Hindu corpses cremated”, GNLM, 29 September 2017. "Our findings have revealed that 56 Hindu villagers were killed in Ye Bauk Kyar village massacre which happened around 4 o’clock in the afternoon of 24th August, another 37 Hindus were slaughtered at nearby Taung Ywar village around 10 o’clock in the morning of 25th August, thus the total fatality headcount makes 93 in these two killings. 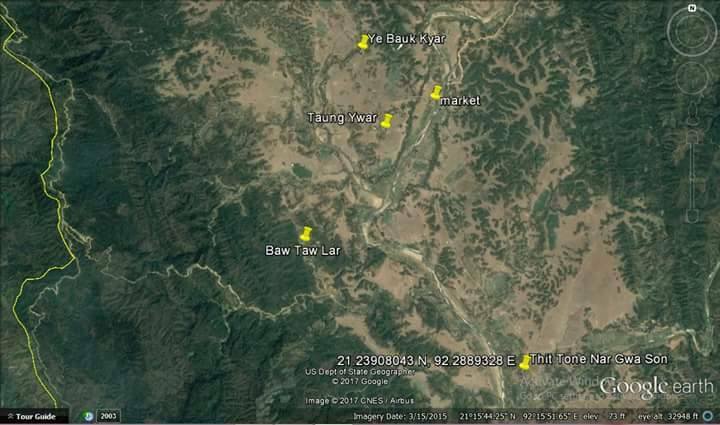 Looking at the timeline of events, the first massacre of Ye Bauk Kyar village was launched less than half a day before the night-time coordinated attacks on 30 security outposts by the terrorists. (A different timeline told by some says that the attacks happened on 28th August and number of people killed are said to be 98.)" "The Daily Star said that the displaced villagers estimated that more than 80 members of their communities in Rakhine State had been killed by unidentified armed men ... reportedly killed by Muslim militants" An 8-year-old girl was away working and lived - "One of her elder sisters is among eight women who said they were initially abducted by militants from the Arakan Rohingya Salvation Army (ARSA), but now sheltering at a relief camp in Bangladesh’s Kutupalong District. " “We watched as they tied each person, hands behind their back and also legs … They cut all their throats and pushed them into a pit,” said one of the women, Bina Bala, 22, adding that the women were spared after promising to convert to Islam. The graves were discovered on 24 and 25 September after security forces received information about slaughtered Hindus who were buried in shallow graves. The surviving women said a Hindu girl, 15-year-old Ma Raj Kumari, was being forced to marry a Muslim man, Barbu, who working at the camp. This was reported to Hindu leader Shaw Phaw Nam Shaw Mar Raw Ni living in Bangladesh, who learned that Hindus were being converted to Islam. The religious leader contacted a member of the BGB and immediately went to the camp. There, the eight Hindu women and children were found. The Muslim terrorists had fled. “Those girls are beautiful. We must force them into Islam”, Norulauk, the leader of the terrorists, allegedly said, according to the eyewitnesses. The females who were spared ranged in age from 15 to 25, the Hindu women said. Even though the Hindu religion forbids them from eating meat, the Hindus were forced to eat meals of rice and beef. The Hindu women and children were taken from Kutuparlaung Camp to a BGP Camp where they spent the night. A Hindu monk came and took them from the BGP Camp and sheltered them at his house the following day. On 30 August, officials of the Bangladeshi government took them back to Kutuparlaung Camp, saying that they would provide relief supplies for them. The eight Hindu women and children were accommodated at a chicken farm inside the refugee camp, and a Bangladeshi Hindu man was assigned to guard them. On 19 September, one of eight Hindu women was able to contact her brother-in-law in Maungtaw by phone and told him the location of the scene where Hindu followers, including her husband, were killed. On 26 September, she was able to contact Hindu religious leader U Ni Mal in Sittway, who suggested returning them to Myanmar with the assistance of Myanmar security forces. The women consulted and left the camp on the pretext of visiting a Hindu religious festival. They arrived back in Myanmar safe and sound with the assistance of Myanmar security forces. GNLM vs. New Age vs. other sources. The local and foreign media interviewed Hindu women who returned to Myanmar from Bangladesh, after they were abducted by ARSA extremist terrorists, at the General Administration Department in Maungtaw on 17 March. Ma Fomila, Khamaungseik village: It was between 8 a.m. and 9 a.m. when terrorists entered our house that day. They tied our hands behind our backs, blindfolded us and ordered us to sit in a row. They beat us with sticks and then murdered all the men. They demanded gold and cash from us, and when they got what they wanted, they took us into the jungle. They ordered eight of us (all women) to sit in a hut. They insulted our religion. They asked us whether we would convert to their religion and marry them. As we were afraid to die, we had to give in to their demands. The terrorists ordered us to discard our clothes and wear those worn by women of their faith. They then took us to Bangladesh. We reached the other bank at about 11 a.m. the next day. We faced torture and insults from the women of their faith in the other country. To stop them from harassing us, we told them we would convert to their faith and live in love and peace together. The terrorists warned us to tell the media as they had instructed us to do. Or else, they would tell the media that our villagers and the people of our race were killed by the Rakhine people and the military. One night, they took us to a man named Babu. At that time, more than 1,000 people from their faith were demanding that we be murdered. Babu told the crowd that he would inform the police if we were murdered. We stayed there for some 35 days. We were asked if we wanted to stay back in Bangladesh. We told them we wanted to live on the land where we were brought up under our religion and customs. A 15-year-old named Raj Kumari was forced to marry a Muslim man named Barbu who worked at the camp, they said. The news was reported to Hindu leader Shaw Phaw Nam Shaw Mar Raw Ni who lives in Bangladesh and was made aware that the abducted Hindus were being converted to Islam. "Didn’t you beg terrorists not to kill your husbands?" "We did. We went down on bended knees and begged them. We had given them all our gold and made them promise not to kill our husbands. They slashed my husband even after they got gold from us. I told them that I had given them a lot of gold and asked them not to kill him. When they were about to kill my children, I said I won’t do as they want if they kill my children. I said I didn’t want to survive if they killed my children. [So, they didn’t.] We have a gold shop. Bengalis took all 30 ticals of gold and over four million kyats." 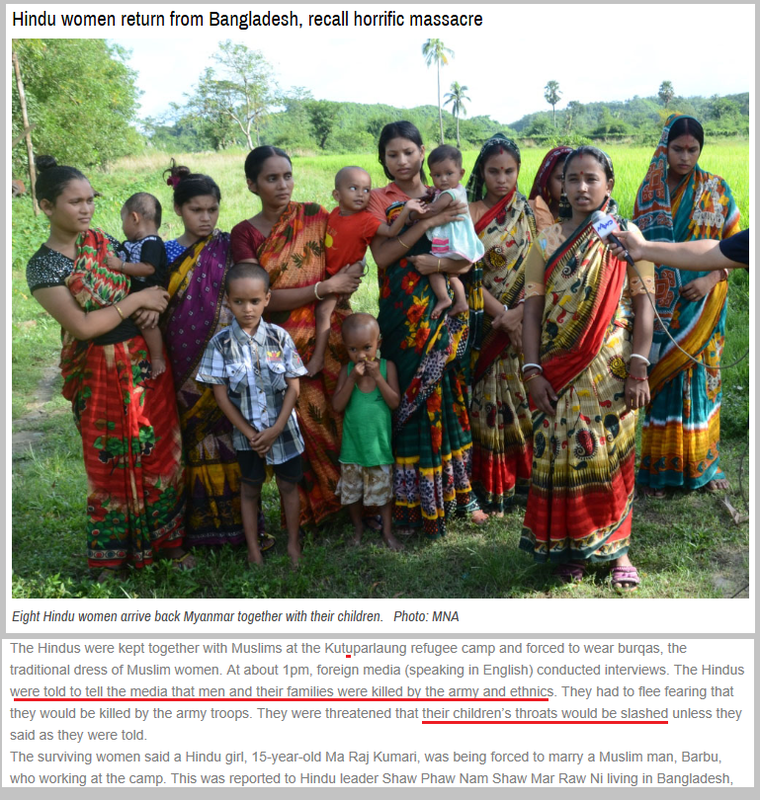 How they escaped: "We contacted [Hindu community leader] U Ni Mal. We sneaked out of Kutupalong Camp. We left for Taung Pyo Letwe in the car of a Hindu man. It took around one and a half hours. On the way, we were inspected by the Bangladesh border guards. The driver said we were going to Deepavali Festival [a Hindu religious festival]. When we got out of the car, we saw government officials waiting for us in Taung Pyo Letwe." Arrived back in Myanmar October 3. In the camp or on the way back, unclear: "Bengalis tried to find us to kill us." By analyzing who was associated with these interviews, told the same story or presented them, these can be partly identified. Journalists who were used in their operation might be called on to say who the propaganda pimps were in this case. The women give some names, and the GNLM report notes the "terroroists had fled" by the time Bangladeshi border guard police arrived to check on or separate the Hindus. That would suggest guilty conscience, plus a tip-off. Oct. 8 22 Rohingya Muslims, who were posing as refugees, have been arrested in Bangladesh, Times Now has learnt. The 22 people are allegedly linked to the massacre of Rohingya Hindus in Myanmar. I'll be hoping to hear more about this. Combined 28 + 17 = 45. Said to be 48 furthers unaccounted for. Total feared dead = 93. Difference = 90 expected dead. Clearer photos (graphic) - we can see throats were cut, etc. But decay is very advanced, so that bodies might be falling apart besides what was hacked into by the killers. 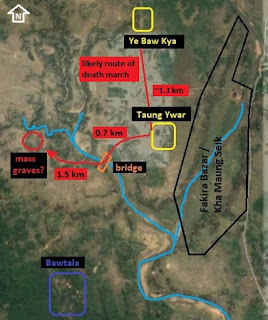 I assembled this from Myanmar information Ministry map showing (YeBawKya or gravesite?). It's about 2-2.5 km on a line west of Fawira Bazaar or Kha Maung Seik. It would require a small river crossing. There's a traffic bridge not far to the south of that line, maybe close to where they started anyway. All distances are small, plus foot bridges maybe more common, or could they walk right across? 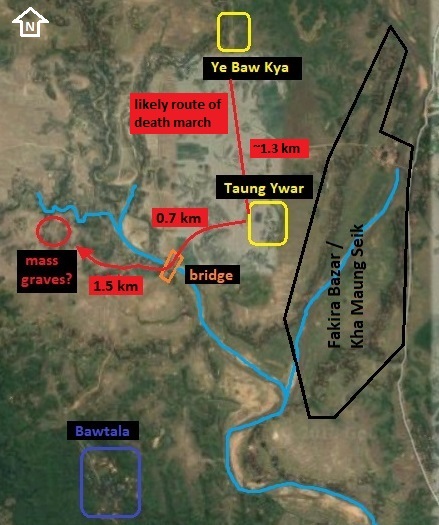 I took two Google Earth views, marking the rivers, comparing to an old US Army map, and noting the mass grave was said to be near Bawtala village, it comes together pretty clearly. Ye Baw Kya? Taung Ywar (also cited as a kidnapping origin)? is 1.7 km sw of Ye Baw Kya (So the video saying 100m NW had it wrong?) and 1.5. km due west of Taung Ywar. But I think this map got Bawtala wrong - too far south to agree with the red dot on the gov. map and the US army map that seem to agree. Map updated to show this. Perhaps the same guy behind the video, uses the same lower left map but clearer as a jpeg. Comparing features (a pain with no layering options), I made a mess of a graphic to clarify to myself these maps disagree on the placement of both Ye Baw Kya and Taung Ywar (however you attach a label to a dot in the latter). But both these maps agree on Bawtala being due west of the river's big bend. 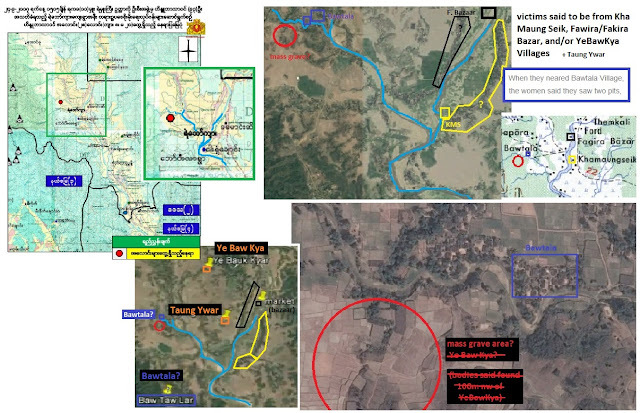 So I guess I was wrong with the first take, misled by an imprecise and old map coincidentally putting it very close to Naypyidaw's red dot said to be "near Bawtala." How I read it now is at right: they never got very near. They headed that way, southwest, which also towards the Bangladesh border, likely crossing that bridge. But then maybe veered right and buried the people near whatever town that is, at least 3 km north of Bawtala. It may not matter or be worth it, but for geolocation purposes - scene photos from the mass grave to use comparing to satellite views in that area/those areas. Where the actual grave is - less clear, but should be nearby - in the woods, some views suggest, or at the edge. Noting later: near the bodies there's an undulating edge between the little hill they're at the bottom of, and the surrounding rice paddies. In the top and bottom images we can see this connects to two other smaller mounds at sort of a right angle. There are several little "islands" like this out in the paddies in this area, but this is one of at least 3 parts in maybe an L shape, one with substantial crown of trees, in which apparently they found the two pits with 28 bodies on August 24. Hindu Families's Statement against pro-axis Rakhines and Govt. Interesting point: at 2:52 woman is asked if their area (Foira Bazar) is in Burma. She says "no, in Arakan" (the Rohingya Islamist name for the area). Was she reading too far into what they wanted to hear? Yes - everyone else corrects her - the other women and the video host, whose message seems to be "we're just saying where you're from, not making a statement - it's Burma/Myanmar, to the outside world. But yes, it's what we call Arakan in private, and what the maps will hopefully call Arakan soon. Good girl." Rika "the Myanmar military and Buddhists killed our husbands and fathers because they were unwilling to take part in killing Rohingya Muslims in our village"
Anika: ‘I am carrying for six months. Myanmar military and Buddhists community killed my husband for not participating in killing and ousting Rohingya Muslims." 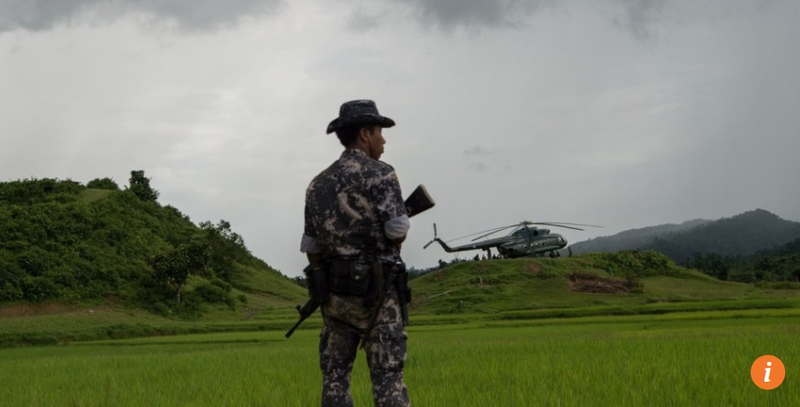 Shawrassati: "Buddhists community and Myanmar militaries ordered them to take part in killing “foes” and ousting Rohingya Muslims from their homesteads. But my father did not take part in this killing. Later, Buddhists community and Myanmar military caught my father from house and killed him. As my mother tried to save my father, she was also killed by them." WION: Reka Dhar says she doesn't know who were the masked men that hacked her husband to death, but some nice Muslims agreed to help her and others escape "because we promised them we would convert to their religion." Al Jazeera English video report from the camps speaks to two others of the kidnapped girls (unknown to reporter). Annica Bhar (15, pregnant, cited above) tells how "masked men" killed her husband and others while she and a friend (name spoken but unclear) "were spared" (unexplained). The reporter suggests it was government forces behind it. "Now in Bangladesh, 20 Muslims and Hindus gave interviews in which they recounted how they were forced out of their village of Kha Maung Seik in Myanmar’s Rakhine State on Aug. 25." One says “All the Muslims in our village, about 10,000, fled." 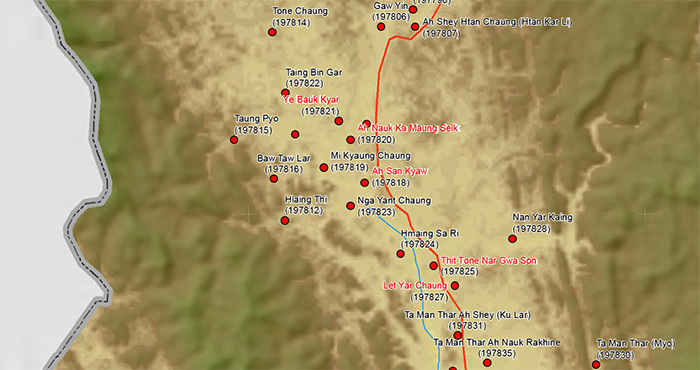 The army is blamed for initial assault, with civilian Buddhist thugs brought in for the massacre. 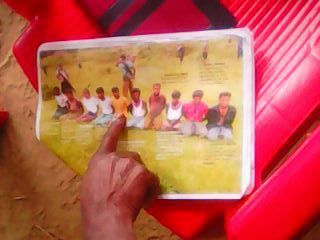 Some of the 8 captured women were presented for this article, telling what they now insist was a false story: "A group of Hindu women refugees in Kutapalong said they saw eight Hindu men killed by Buddhist Rakhines after they refused to attack Muslims. “They asked my husband to join them to kill Rohingya but he refused, so they killed him,” said Anika Bala, 15. Six months pregnant, she said Muslims helped her get to Bangladesh." Sept. 27: "Burmese Govt has to Stop 'Victim Blaming', Allow Investigations into Atrocities; ARSA Denies of Targetting Civilians." Attached statement denies specific crimes alleged in the Hindu villages on August 25. 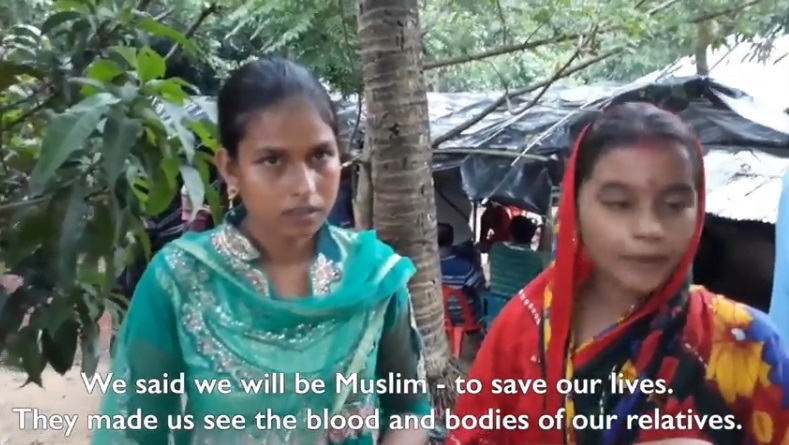 Someone posts a snippet of this longer video of the captive Hindu women thanking the Muslims for saving them from the Government-Hindu massacre. "An alleged Rohingya insurgent, along with his supporters at the Kutupalong refugee camp in Bangladesh, accused the Rakhine Buddhists of the Hindu massacre and putting the blame on Rohingya Muslims." The same #Hindu women gave two versions of testimonies. First they said their husbands were killed by #Rakhine Buddhists. Now saying #Muslims. 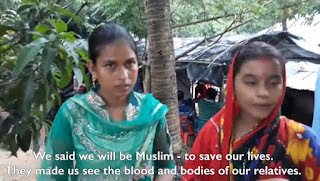 Oct. 12: Shaikh Azizur Rahman write in the Guardian "A group of Hindu women who crossed into neighbouring Bangladesh from Myanmar after surviving the attack claimed the Myanmar military carried out the massacre. 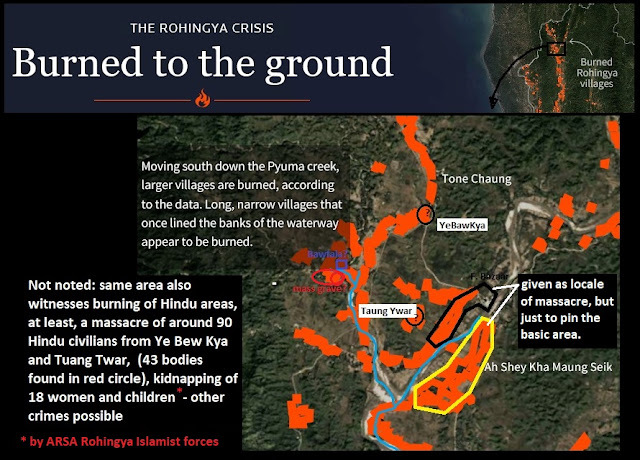 However, when they were subsequently returned to Myanmar by security forces, they offered a different version of events, blaming Rohingya militants" (incorrect - this was said repeatedly inside the Hindu camp in Bagladesh). "Rohingya refugees have accused the Myanmar government of playing “dirty tricks” over the killings." Human Rights Watch, September 27, dismisses the claims as "playing politics with the dead" - something only the "Rohingya" are allowed to do here.